One of the first things that people notice are the eyes, which have been regarded as “the windows to the soul” for thousands of years. Nothing screams “I am old and worn out” more than bags, wrinkles, and dark circles under and around the eyes. Many people resort to expensive and risky plastic surgery treatments in an attempt to make the skin around their eyes more firm and vibrant, only to find that these solutions are temporary and overpriced. Fortunately, there is a way to naturally reverse the aging process and restore the youthful beauty of your eyes in just a couple of weeks. Xtend-Life Eye Contour Serum utilizes state-of-the-art ingredients that work in conjunction with your body to restore biological functions that are responsible for healthy, smooth, soft, and attractive skin. Unlike many other skincare products, Xtend-Life Eye Contour Serum does not include an SPF factor, as there have been possible health risks associated with skin care products that contain SPF factors, and contrary to popular belief some studies even indicate that they may be carcinogenic. While most other skincare products are capable of irritating sensitive skin, Xtend-Life Eye Contour Serum is designed to accommodate the unique needs of every skin type, whether you have dry, acne prone, or ‘normal’ skin. Since the majority of skincare fragrances are comprised of synthetic chemicals that can cause allergies, Xtend-Life Eye Contour Serum does not contain any artificial fragrances or other ingredients that could block pores and cause irritation. Instead, the serum contains nutrients and natural ingredients that have been proven to soothe and relax the skin. Even so, the Eye Contour Serum does have an appealing smell due to the natural extracts, however this odor is quickly absorbed into the skin and is very subtle. Xtend-Life Eye Contour Serum is unique because of two main active ingredients – Eyeliss and Haloxyl. Eyeliss has been clinically proven to reduce puffiness, bags, and circles around the eyes. In fact, during a 28 day study more than 65% of volunteers showed an obvious reduction in bags and wrinkles around the eyes. Haloxyl has also been clinically proven to be effective, with a study of 22 volunteers showing that 60% of participants had a notable reduction in dark circles after less than 60 days of using this ingredient. Xtend-Life Eye Contour Serum also contains various other ingredients, including the patented Xtend-TK, Nanobelle coenzyme Q10, Homeo Age, Babassu, Crodomol, Vitamin E, and the renowned manuka honey. All of these ingredients combine to create one of the most powerful eye skincare products on the market. Every good skincare product should have clinical studies to back its effectiveness, so it is no surprise Xtend-Life conducts extensive studies to prove the value of their products before releasing them. More specifically, Xtend-Life conducts clinical studies for all of their active ingredients before incorporating them into a product, which is an essential step in ensuring safety when mixing natural organic compounds. Not only does this allow Xtend-Life to accurately measure the power of each ingredient, it also lets them create a solution that works synergistically for maximum results. In fact, Xtend-Life is so confident in their products that they offer a 100% moneyback no risk 6 month guarantee. The guarantee states that only quality ingredients are used, and that all customers that are not completely satisfied will receive a full refund or product placement (based on preference) with no questions asked. 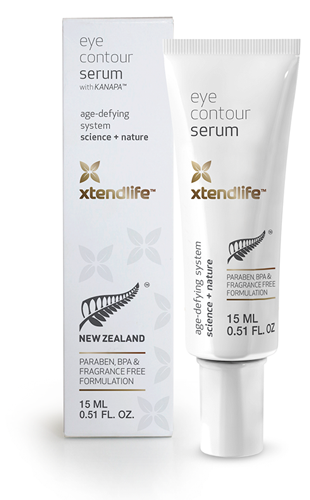 Visit Xtend-Life Eye Contour Serum page to learn more about how to get younger looking, vibrant eyes in two weeks. Nobody Wants Sagging Eyelids But Is There A Product That Can Really Help? The Under Eye Wrinkle Problem – Can Anything Be Done To Address This Issue?